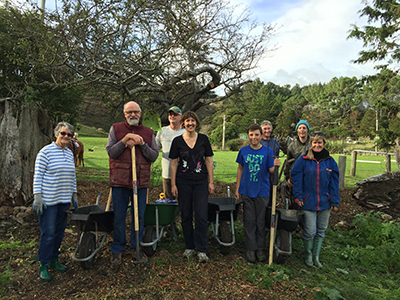 Scroll down to see the progress achieved by the Heritage Gardener's in 2016, with the support of the local community and Wellington City Council. Joe McLeod of Nga hau e wha o Paparangi blessed some hand reared ferns and Claire planted these according to maramataka - the Maori lunar calendar. 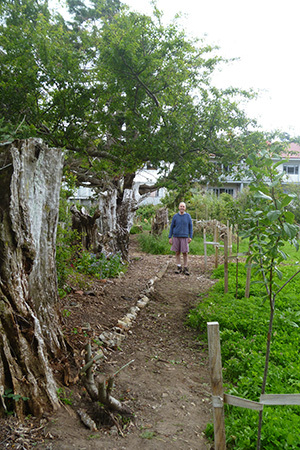 Lorna led two more 5 x 5 metre digging sessions in the orchard for the herbal ley. On the last day of the year, we had a working bee to remove pest plants. We rested from our labour with Christmas cake and reflected on a successful and happy time in the garden these past 12 months. 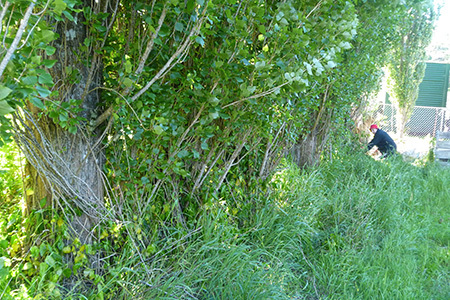 Paul cleared the invasive periwinkle beneath the poplar trees. This was a big effort over two mornings, which he did on his own. 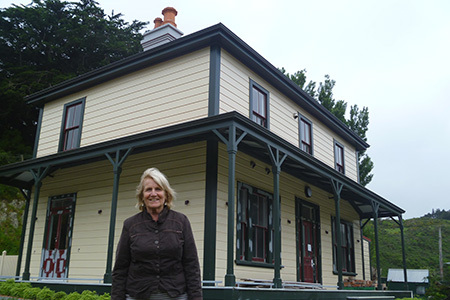 We met with Catherine Richardson, who lived in the house and spent her childhood growing up in the garden. 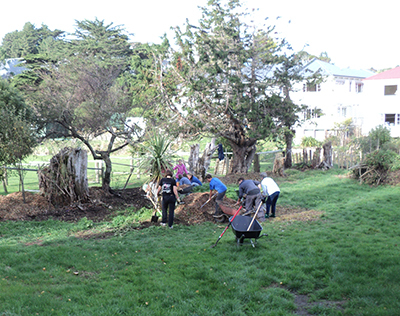 We dug the soil under the fruit trees to plant a herbal ley. The herbal ley will recycle nutrients from the subsoil, fix nitrogen and provide food for birds, ducks and insects. The seed mix includes red, white and subterranean clovers, buckwheat, alfalfa, phacellia, yarrow, plantain, chicory, sorrel dandelion and parsnip. 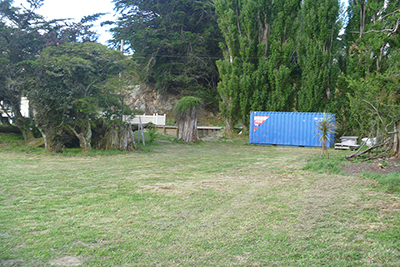 We bought it from Koanga Gardens. Matt the Park Ranger preparing to fell a dead tree. Photo: Paul Bicknell. 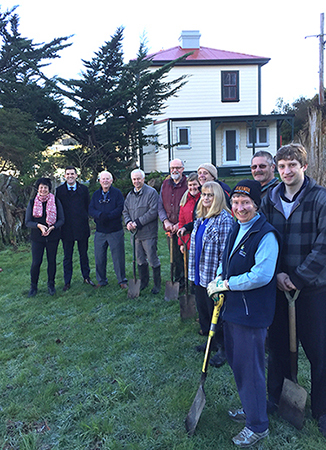 We made several visits to the historic 1876 Golder Cottage at Upper Hutt, to take cuttings of original settler plantings. The lilac is a favourite and we look forward to the first flowering. 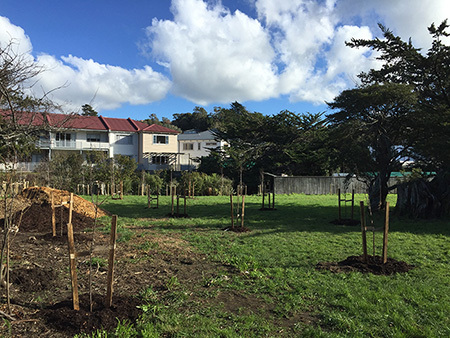 July 2016 - We planted an orchard! 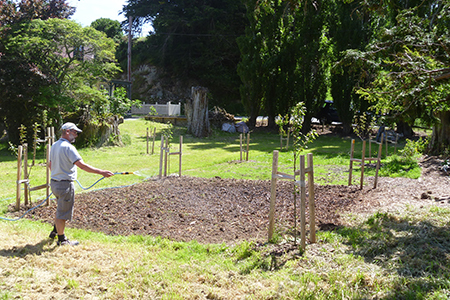 Sixteen heritage fruit trees were planted on July 16th. 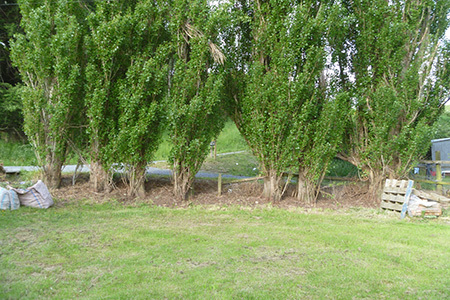 Each tree has been sponsored by someone with a connection to Glenside. 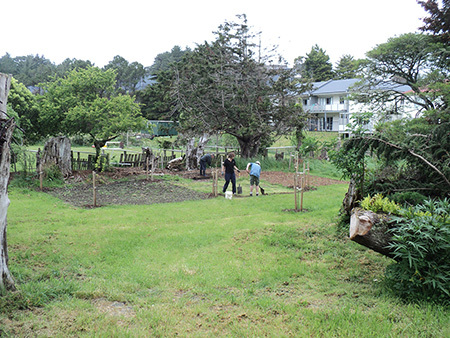 The types of fruit trees we planted grew in the original farm orchard of early pioneers, the Stebbings family, or were listed for sale in the 1878 garden catalogue of William Wilson McCardle, Wairarapa. 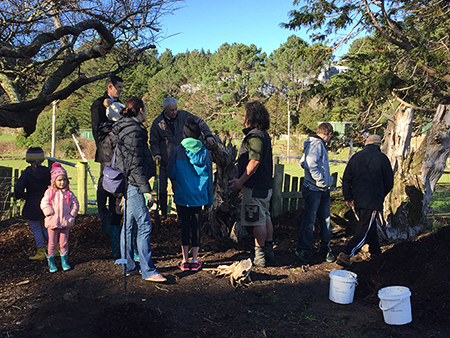 There was a big turnout from the community to get these trees into the ground. 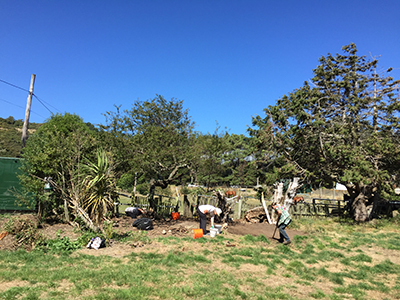 Later in the month, Paul and Claire planted native grasses hand reared from Jay Street Community Garden, along the streamside. Earnest discussion during a break. It was Local Body Election time! 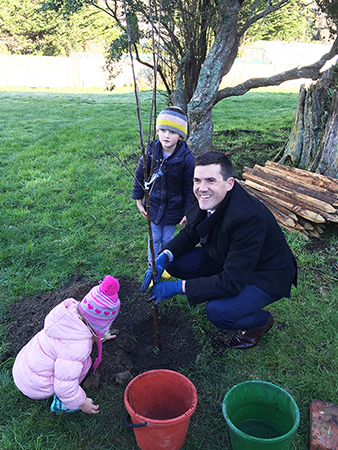 Justin Lester, who was later elected Mayor of Wellington, brought the little ones along. A brisk frost on the ground made us keen to get digging and warmed up! June 2016 - Exciting finds. 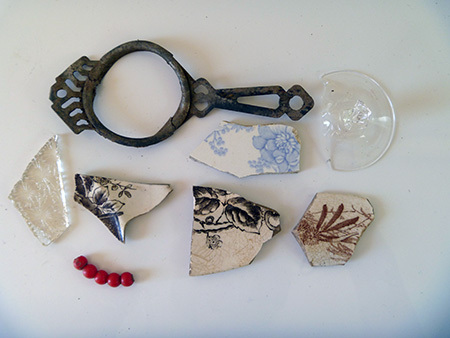 We have unearthed more than 200 intact bottles. Pictured here are two New Zealand bottles. 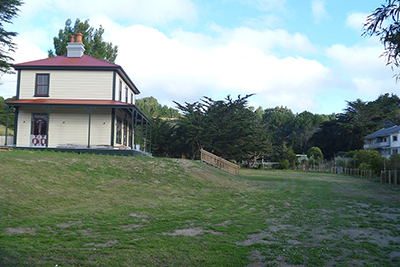 The Ohinemuri Regional History Journal inform us that Paeroa mineral water was first bottled for sale in 1909. 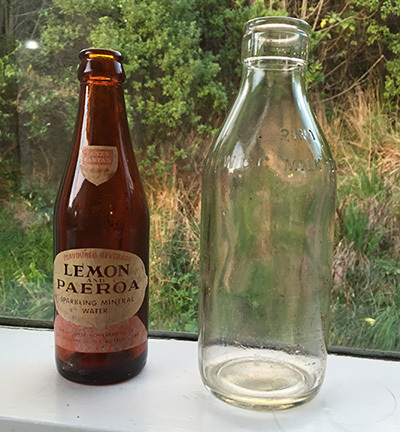 The Lemon and Paeroa bottle dates from 1964, a year after C. L. Innes, a Hamilton aerated water manufacturer, formed Innes Tartan Ltd and became involved in the manufacture and sale of the popular drink. The milk bottle is marked ‘Pint WCC Milk Dept’. This bottle will likely date from 1957, when Wellington City Council went from using cardboard bottle tops to foil bottle tops. There is excellent four and a half minute 1947 film on the Wellington City Libraries website, showing the process from the time the farmer’s milk is received at the Otaki depot, until it is bottled ready for delivery. 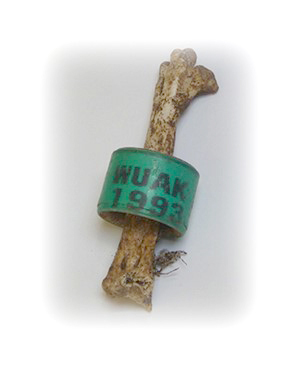 The band on the leg of this bird was identified as a racing pigeon from Auckland Western Union. Pigeon Racing New Zealand Inc. passed this photograph onto the owner, to be notified of the demise of the bird. 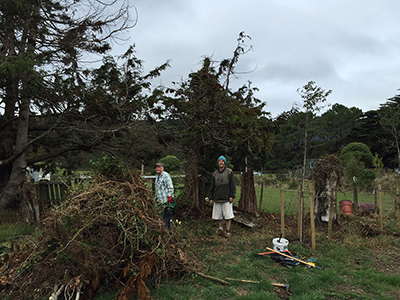 Joan and Paul clearing out invasive ivy. 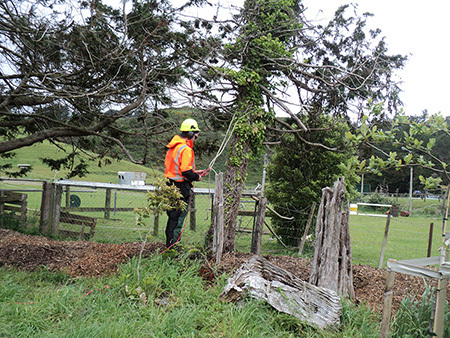 Clearing the plum tree site. 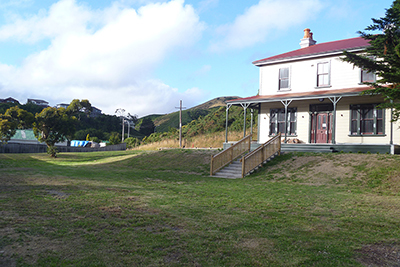 The Halfway House grounds, looking lovely in preparation for the Glenside Show. 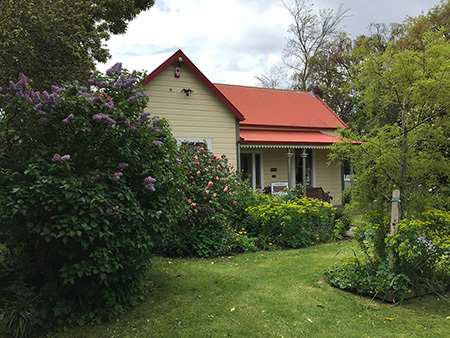 Glenside Show Day is held on Wellington Anniversary day and is a fun-filled opportunity to show the best of flowers, vegetables and family pets.